As you arrive at Heritage Marina to collect your dayboat you will be given instruction on how to handle the boat, as well as a helpful map and suggested stops along the way. If you would rather spend the day on the move, you are able to cruise as far as Bosley locks, just over three hours away. 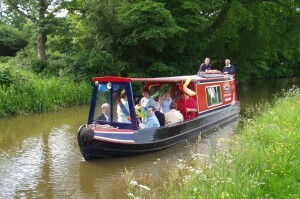 Relax as you travel at a leisurely 3mph, picnicking on board, or stopping off at a canal side pub along the way. Day boat Daydream costs £120 weekdays and £150 weekend days and bank holidays from 9.30am to 5pm from the beginning of March to the end of October. Both our day boats are also available in November and February subject to weather conditions and at a reduced rate of £100 for all days; running from 9am to 4pm due to daylight restrictions. All Bookings must be made in advance.